If you’ve come from a Westie background, you’ll be used to the benefits of a pop-top camper conversion. But back when Westfalia first converted Volkswagen vans there were no other options you could stand up in. The high roof Sprinter has 6’3″ of headroom. If stand-up height is your only concern, a pop-top may not be a good fit for you. Update: for 2018, only Cargo vans can be ordered with a low roof. If you order a Crew or Passenger van, it’ll be high roof. The only big issues here are how many passengers the Cargo vehicle is rated to carry (2 rather than 5+), and the lack of captive nuts in the floor for mounting a passenger bench seat. Here are the pros and cons of the high roof van versus the low roof with a pop-top conversion. There are some things that pop top vans excel at. The largest benefit is the lack of additional height. 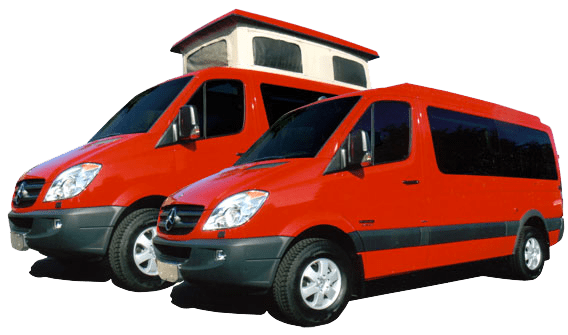 Having a high-roof van, we have to constantly look out for overhead branches when we’re off road, and overhead height restrictions when we’re around town. More bed space – you can have a regular platform bed in the back of the van, plus space for two in the loft area. Easier parking – the van will fit in most regular household garages with 8′ doors. Fit in more drive-throughs – if you really can’t live without your fast food fix or morning coffee, you’re less likely to take off the awning above the delivery window with your low-height van. Better ventilation – lots of space for air to circulate through the van, and cooler air than at ground level. Most “windows” in pop-tops come with bug screens too. Feels more adventurous – looking out at head height gives you that “penthouse” feeling. Not at all stealth – if you want to overnight on a city street and sleep up top, it’s going to be pretty apparent that someone is inside the van. Insulation – there is some insulation on modern pop-tops but not as much as you can add in a regular van wall. That might not be an issue for most situations, but winter camping could get cold. Snow would make things even more interesting. Security – with the top up, the van is easier to break in to. Roofspace – modern pop-tops can carry quite a bit of weight, but loading them down with solar panels may be too much of a strain. If you got a low-roof van so you could load kayaks or other long, unwieldy items, the pop-top is going to be in your way. Solar panels placed on the roof around the top would risk being shaded for much of the day. Installing a fiberglass replacement roof is probably not a DIY job for most people. It involves cutting through several roof support beams and removing a large section of the roof metal. There are three main companies in the USA who offer conversions. The cutout means that you have a little more room to stand in the van even with the top down. Sportsmobile claim 5’10” height when the top is down (5’3″ where the bed rests), and 8′ when it’s up. Their bed attaches to the top of the pop top when you want it to move out of the way. They claim an R value of 14.9 but they’re using bubble foil so that’s almost certainly based on a manufacturer’s inflated claim rather than the reality in this situation. The top adds 345 lbs weight. 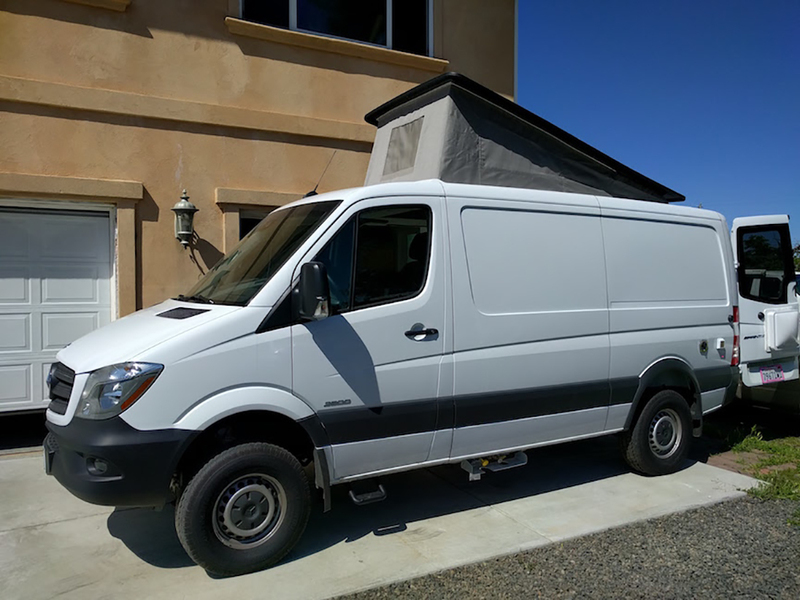 The low-roof Sprinters have 660 lbs allowable weight, so there’s still more available for solar panels or similar, so long as the pop top mechanism will support the extra weight. There is an electric version available. 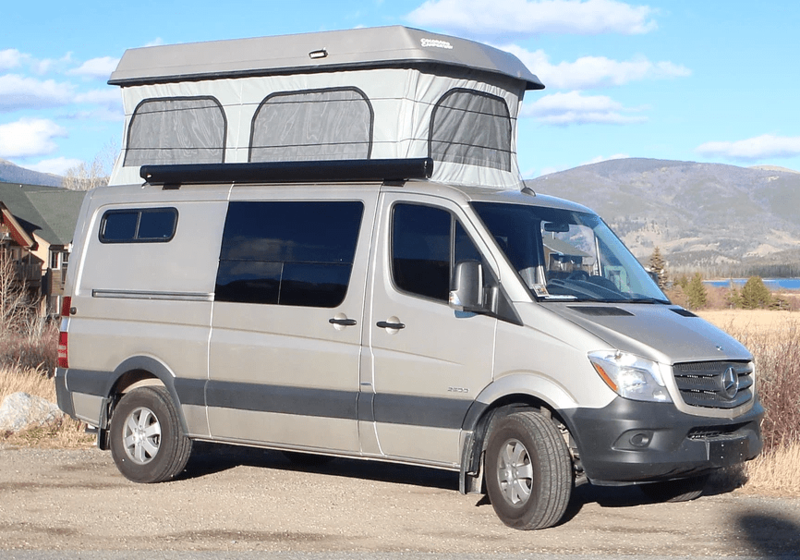 Colorado Camper Vans make a motorized pop-top including the bed, LED lighting, and six screened windows, but no insulation as standard. They claim their top is “the tallest on the market” and that looks to be true from the photos. However, the bed can’t be attached to the top, so it can not be totally raised out of the way. You’d have to fold it up and to one side or otherwise move it to gain the full standing height inside the van. $8000 installed, although insulation and some other options like paint color matching cost extra. GTRV’s V style pop-top is a hinged design. Rather than moving straight up, it hinges at the back to make a wedge shape. This is more like the original Westfalia design but it does reduce available space in the top. The front gives 7′ of space, the rear is not much taller than stock. They also make a T style top which is similar to the Sportsmobile and CCV versions. That one is unavailable at the moment as they retool the design. However, it’s got 6’4″ of headroom according to their site. 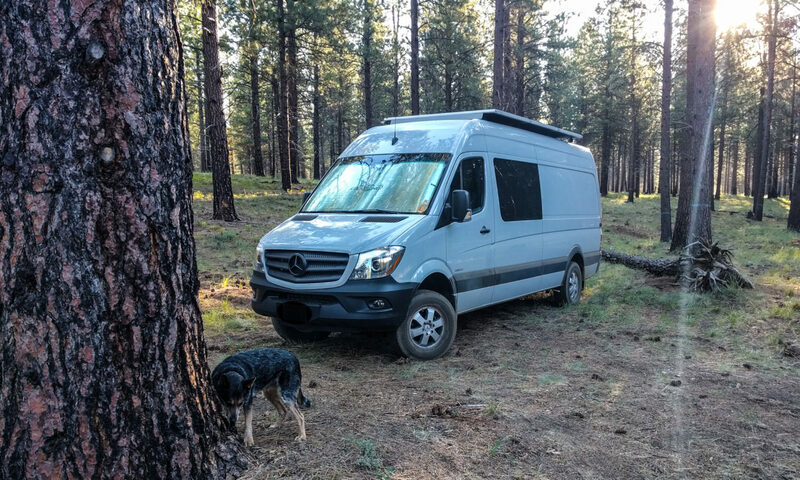 GTRV differentiate themselves by having a very low profile top (adds only 3/4″ to the van’s height) that is light weight (150lbs). GTRV seem to focus more on full conversions rather than just adding a top, so there’s no pricing available on their site.